I recently wrote about Puck pooping on the sofa in the Florida room and many of you wrote back with suggestions about putting things like plastic on it to discourage Puck from pooping there again. I didn’t have any plastic that I could spare but I decided to put the cat’s Turbo Scratcher on the spot where Puck was pooping. I was hoping it was that spot or nothing but he just pooped on the other side of the couch. 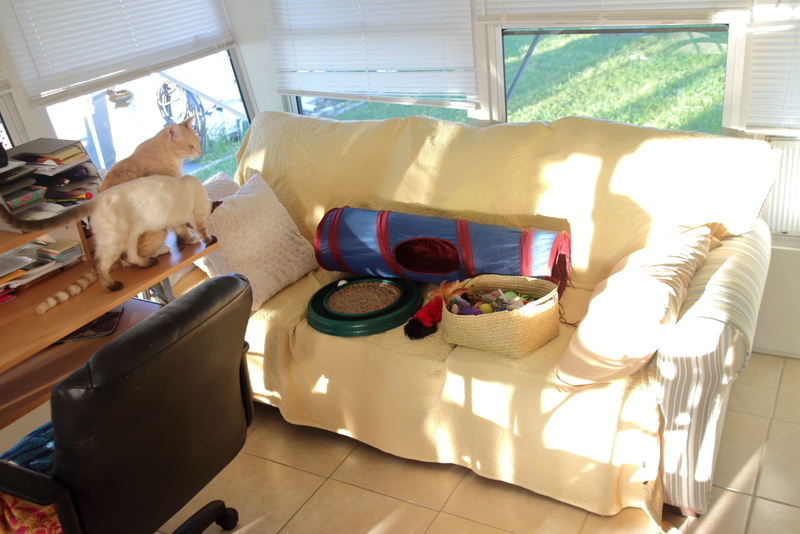 I then loaded up the couch with many of their toys. That worked, somewhat. The next day I found a pile of poop on the floor in front of the litter box. That’s not ideal but I prefer poop on our tile floor over poop on our couch. Thursday was the day our cleaning woman comes and I think my wife was embarrassed about our “messy” sofa and insisted I take all the toys off of it. I did, and it lasted until Friday before I found poop it, so back the toys went. Since then I have cleaned poop off the floor about four times, including morning. As I was writing this post, I took a short break and noticed a pile of poop on the ground. Since I scooped twenty minutes before, two of the litter boxes were clean but the one with poop in front of it had been used once. Puck has never had an issue with the litter boxes before and I have no clue what could have changed with him but I hope I figure it out soon. This entry was posted in Uncategorized and tagged cat, couch, Litter box, poop, sofa on October 11, 2016 by Charles Huss. Next time you are out & about get some plastic painter’s drop cloths – they are thin but usually big enough that they will cover the couch without being completely unfolded. And cheap. And maybe try the “litter Attract” type of products. Praying that you can get this resolved for your sake & Pucky’s ! (and naybe by now it isn’t just Pucky, as the others want to mark too. Thanks Mary. I tried the litter attract but it’s not working. I sure wish I had an answer….I know our Vet recommended a new book that is out for me, in reference to Cody’s constant chewing of all sorts of items, it is called “The Trainable Cat” by I believe John Bradshaw (and a woman whose name I can’t remember)…a few bloggers have reviewed it, I don’t have the book yet………I am thinking there might be a solution in that book? Or Amy Shojai’s Cat Facts…..I reviewed it, can’t remember if there is a chapter in there about pooping but I can look later today if you need me to. 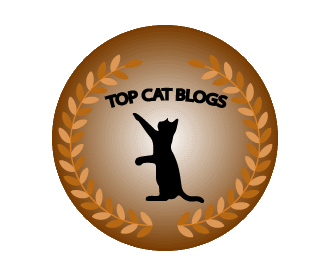 Also, there are so many who read your blog with way more experience with multiple cats than I have, hopefully someone can help! Thanks Caren. I will look into it. I went thought this for years with Chris but his solution doesn’t work for Puck. It is an information that he doesn’t like? What a problem, cats are very difficult to understand. We had a cat, who showed that he doesn’t like of something by peeing on the wall. Not very nice. Hope you figure it out soon, poop surprises makes nobody happy. I wish I knew what changed. New smell in a litter box, some different cleaner used to those boxes or near the boxes? I don’t know about that but I’m going to change the litter tonight. I don’t think that’s the problem since it has been going on for a while now. Could it have something to do with Floki? It seems like this started happening more often again after he came to live with you guys. Sometimes adding a new cat to the family takes some rearranging and adding of feline “real estate,” and Puck seems like he is a bit on the insecure side. In any case, something happened in Puck’s world to make his start up with this again. What seems minor to humans can be a really, really big deal to cats. You are right. Floki might be at least part of the problem. Those big sheets of plastic that painters put over furniture are CHEAP – I got a bunch of those at Walmart for very little $$$ when we were painting years ago…….they are thin but definitely will protect the couch AND let you actually SIT on it once in a while instead of sitting on a pile of toys!!!! Of course that doesn’t solve the “in front of the couch poop” issue……I don’t suppose Puck does not like the litter you use – NAAAA….couldn’t be THAT simple….but it’s a thought! It started shortly after we bought the couch and stopped for a while after we moved the litter boxes to a new location. I don’t know why it restarted. Granny calls us creatures of habits and that is probably because it starts all over again. She says, the litter was just a distraction for a while and then it went all back to normal…except of the couch, that wasn’t normal. Somethings tells me that Puck doesn’t want it there. Try to tell him that you want the couch in there and why you want it and don’t forget to repeat it over and over again. Maybe you already have done that, but from experience we know that when you tell them what you want and how you want it, they finally listen and the problem might be solved *puts paws together* …. I agree. Chris had the same problem before. He would be in the box and poop outside the box. Just like Puck. Good luck figuring that out, sometimes we need detectives to figure out our cats’ behavior. Poop is a bit different than Pee and they call this Middening. It generally happens when one cat gets to feeling insecure for one or several reasons. It can also be due to being uncomfortable when pooping. The kitty will go to poop and then OUCHIE… They give the litter box a hard look and you have a poop about. Our Brofur Buddy Budd does this in front of the one box and hits within a half inch of the same spot every time. Dad put a bit of rug in front of the box and keeps paper towels handy as Buddy has kept it up. If it is due to lack of confidence playing with the cat in front of the others may help build up the ego. It’s so complicated. Puck is our most insecure cat, but Chris did the same thing when he was young and he was always the alpha.